Angelica won the coveted Judges Choice award for superior fleece at the 2013 Tennessee Alpaca Waltz Fleece show! In addition the Reserve Champion in her color class and First Place in age group! 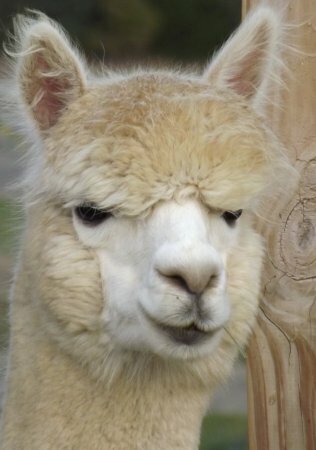 Astounding for such a light colored alpaca like herself! 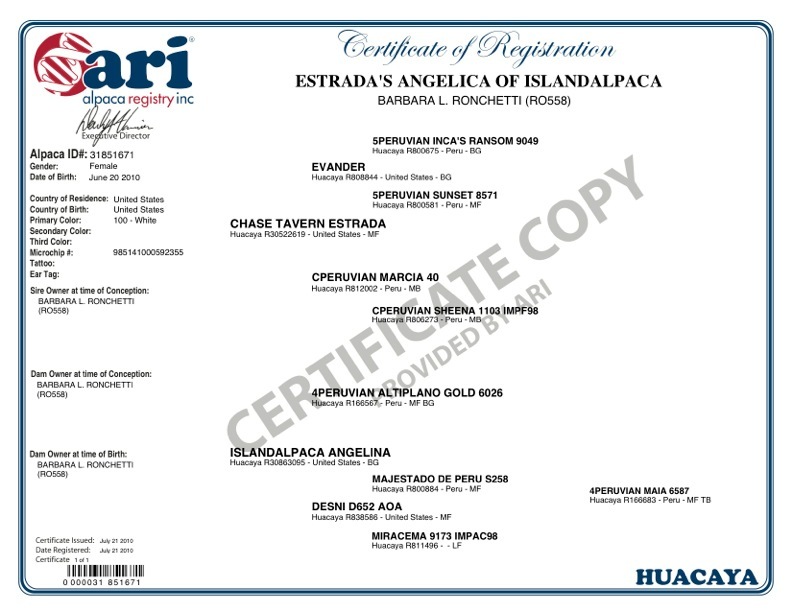 Angelica, just like her sisters and brother: Anika, Angelito, Silver Angel, and Penelope look just like their dam Angelina. Angelica's fleece is an astonishing white that is very bright, dense, and fine. It's nicely uniform and she has a very long staple length. For the last couple of years now Angelica has been shearing off over 10 pounds! In 2013 she sheared off 12.2 pounds. Amazing! Angelica, just like all of her siblings and dam, have an almost perfect phenotype! They have great conformation with a strong frame, they are thick-boned, have impressive top-knots, nice thick short muzzles, and overall a beautiful and pleasing look. Angelina seems to have very strong genetics! 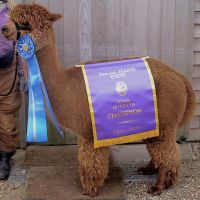 Angelica has both champion ribbon winning parents. Her dam Angelina and her sire CT Estrada. 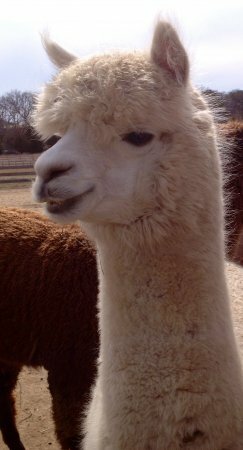 She's a gorgeous alpaca with a pure white fleece and to top it all off she has a very sweet personality and gentle nature. 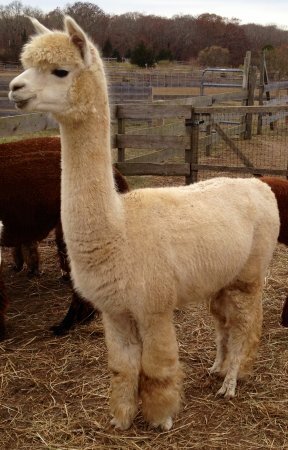 Currently Angelica is due for a 2019 cria, sired by our very own Cassiel of Island Alpaca! 2015 Southern Select Alpaca Show Spin-Off judge Judy Maxwell commented: "So crimpy and bundly. Very pretty. Nice sheen. Felt wonderful. Bouncy and soft." Yarn Criteria Highlights: First Impression, 5 out of 6. Usability, 7 out of 7. Brightness/Luster, 6 out of 6. Handle, 6 out of 6 possible points. Angelica scored a 92/100 with her fleece! Amazing! 2014 Green Mountain Alpaca Fall Spectacular Show - Judge Ursula Munro commented: "Nice fineness in the fleece! Soft hand with good uniformity." Fleece Score Highlights: Fineness/Handle, 18.5 out of 20. Length 6 out of 7. Color, 5 out of 5 possible points. 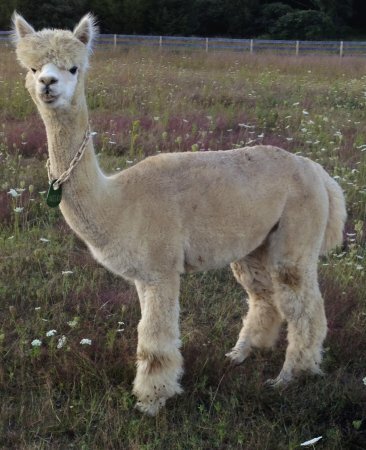 2014 Empire Alpaca Extravaganza Show - Judge Cheryl Gehly commented: "Good fineness throughout!" Fleece Score Highlights: Fineness/Handle, 18.5 out of 20. Length 6.5 out of 7. Color, 5 out of 5. Brightness, 8 out of 10 possible points. 2014 Big E Alpaca Fleece Show - Judge Wade Gease commented: "Preserving wonderful fleece traits with age! Crimp and brightness were noticeable!" Fleece Score Highlights: Fineness/Handle, 18 out of 20. Color, 5 out of 5 possible points. 2014 New England Hands on Alpaca Fleece Off Show: "Excellent fineness and uniformity being maintained into maturity - nice!" Fleece Score Highlights: Fineness/Handle, 18 out of 20. Micron, 7 out of 8. Length 6.5 out of 7. Color, 4 out of 5 possible points. Total fleece score was 79/100! 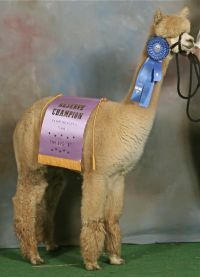 The alpaca in her class who won first ended up wining the championship for the whole show and had a score of 81/100. Angelica was so close! 2013 Tennessee Waltz Fleece Show: "Fine fleece with great handle and character overall." Fleece Score Highlights: Fineness/Handle, 18.5 out of 20. Micron, 7 out of 8. Length 6.5 out of 7. Color, 5 out of 5. Staple Type/Density, 4 out of 5 possible points. Total fleece score was 81/100! 2013 Green Mountain Fall Spectacular Fleece Show: Judge Cheryl Gehly commented, "Fine, soft, dense fleece!" Fleece Score Highlights: Fineness/Handle, 19 out of 20. Micron, 7 out of 8. Color, 5 out of 5. Staple Type/Density, 4 out of 5 possible points. Total fleece score was 81.5/100! 2013 Empire Alpaca Extravaganza Fleece Show: Judge Ursula Munro commented, "Excellent fineness! Bright with good uniformity." Fleece Score Highlights: Fineness/Handle, 18.5 out of 20 possible points. Sheared off 12.2 pounds of fleece in 2013! Sheared off over 10.0 pounds of fleece in 2012!